Shoulder dislocation is a common joint condition, which causes pain and immobility for patients when moving the arm. 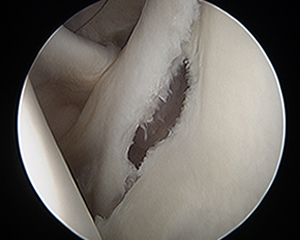 While conservative treatments work for the majority of patients, arthroscopic surgery is indicated when dislocations become chronic and reduction fails. For more information, contact Dr. DuBois’ La Mesa, CA offices to schedule an appointment. With its ball-and-socket design, the shoulder is the body's most mobile joint; however, this mobility leads to instability, making it also the most commonly dislocated joint. This condition, in which the humeral head is pulled out of its socket, causes significant pain and makes any movement extremely uncomfortable. Additional symptoms include swelling, numbness, muscle weakness, and shoulder bruising. Dislocation injuries fall into two categories, depending on the severity of the injury: partial dislocation (subluxation), in which the humeral head is only partially out of the socket, or complete dislocation, in which the humeral head is pulled all the way out of the socket. In either case, the injury can result in ligament and tendon tears in the shoulder, as well as nerve damage. To further describe injuries, dislocation is categorized according to the direction in which dislocation occurred, including forward (anterior), backward (posterior), or downward (inferior). Anterior dislocation is most common, and accounts for 95% of shoulder dislocation cases. The shoulder is at risk of dislocating anteriorly (toward the front) when the arm is held overhead with the elbow bent. As force is applied that pushes the elbow backward, the humeral head ("ball") is displaced from the glenoid fossa ("socket"). This includes activities such as throwing a ball or hitting a volleyball, or falling onto an outstretched hand. When the humerus is pulled out of its socket, the shoulder's components may stretch beyond their means and tear. This includes muscle, tissue, and joint cartilage, which all work together to stabilize the joint and protect it against friction and natural degeneration. When shoulder dislocation ruptures any of these components, patients will experience pain and severe discomfort when moving the arm in any direction. When assessing a patient's injury, the doctor will examine the shoulder and order an X-ray. The doctor will evaluate the shoulder's placement and look for a "squared off" appearance, versus the normal rounded appearance. It is important to let the doctor know how the dislocation occurred, and whether the shoulder has been dislocated previously. As with any musculoskeletal injury, it is best to receive a proper diagnosis and treatment recommendation from a board-certified orthopaedic surgeon, such as Dr. Benjamin DuBois. 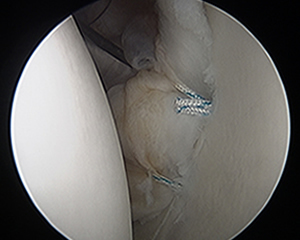 To correct a dislocated shoulder, a procedure known as closed reduction may be performed. The attending surgeon will place the humeral head back into the glenoid fossa, stopping severe pain almost immediately once the shoulder joint is back in place. Patients are often encouraged to immobilize the shoulder joint using a sling, wrap, or brace after reduction. Immobilization reduces the amount of pain as a result of movement, and facilitates regrowth and natural repair of the injured components. After shoulder pain and swelling are reduced, rehabilitation exercises can help restore joint function and strengthen muscles. These exercises may also help prevent future shoulder dislocations. Most patients' shoulder dislocations will respond to these treatments; however, if dislocation becomes a chronic issue, surgery may be indicated to repair the torn or stretched ligaments that facilitate joint functioning. Dr. Benjamin DuBois is a board-certified, fellowship-trained orthopedic surgeon specializing in shoulder and upper extremity treatment. Dr. DuBois has expert training in shoulder surgery, and has extensive experience treating dislocated shoulder, performing arthroscopic surgery for sports injuries, and shoulder replacement surgery for arthritis relief. To learn more about dislocated shoulder treatment, schedule a time to speak with Dr. DuBois at his office in La Mesa, CA.